The 2000 Series of self-regulating Heat Trace Products, LLC. 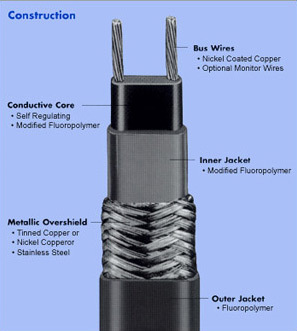 cable represents the highest temperature rated product that we offer. It is designed to maintain continuous temperatures up to 375°F (190°C) and up to 190 psig saturated steam purging, and is the only heat trace cable in its class that can deliver 25 and 30 W/ft. The 2000 Series is designed for freeze protection and process temperature maintenance in nonhazardous and hazardous locations where potentially explosive conditions exist, or in the presence of corrosive and organic material. At Heat Trace Products, LLC., we design complete heat maintenance and freeze protection systems; the 2000 series is just one of many products that we can utilize to engineer a system designed to provide protection for specific heating requirements. For more information about our 2000 series self-regulating heat trace cables, contact us today. 0.125 ½/ft *T-Rating per the 1999 NEC, Tables 500-5(d) and verified by FM and CSA.